"I hear there's rumors on the internets"
We went to the Niagara falls on saturday. Was kinda cool, but not entirely what I had thought it would be. The niagara falls are like in the middle of a small city, I kinda expected that it would be in a more untouched area. Not that it disturbed or anything though. What did disturb me a little was the whether, it was unfortunately somewhat rainy and when it didn't rain it was at least a little gray. So when the falls throw all this water up the air there's sort of a large watery cloud in front of the fall, which melted too good into the gray sky unfortunately, which took some of the feeling away. The good thing however was that you could get a lot closer to the falls than I imagined, only a few meters from the actual fall. There's also this tunnel you can go to get behind the falls. It would probably be better in the summer though, because with all the ice there you couldn't see the falls at all on those lookout positions, only blocks of ice. You could however feel the power of the falls by putting the hand on the windows, they were vibrating quite a lot. Actually, you don't even need to put the hand on it, you could hear and see it shaking. A summer day would probably do the falls more justice, but it was still worth the trip. In not so related news, my brother and sister has none left and are heading back to Sweden when I'm writing this. So now I'm on my own again. yeah, i was there, too, and its beautiful.. i don't remember, but i think we had at least some blue sky..
on the other hand, i bet the snow/ice was a beautiful, interesting view..
hm.. i could see the falls in the tunnel.. but it was more cool from the outside anyways imho..
Yep summer is best for Niagra Falls, you can take the boat right up to the mouth of the falls 'maid of the mist'. Also Marinland is there, Ontarios largest marine Aquarium with whales etc.. 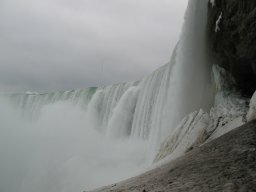 I've heard, it is too loud near the Niagra Fall. And its amazing that some people could live there!